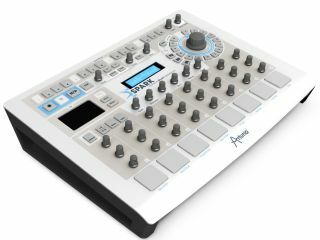 NAMM 2011 PRESS RELEASE: Arturia announces the upcoming release of a highly creative drum machine: Spark. Spark is a complete drum solution made of a software application and a dedicated hardware controller. Combining the power of analog synthesis, physical modelling and samples, through the intuitive workflow of a hardware drum machine, Spark is a highly creative beat production centre. Spark will save you time when looking for the right drum kit, will get you hooked by its amazing simplicity and will surprise you by its sonic possibilities. "For many years, Arturia has been mainly dedicated to creating synthesizers," says Frédéric Brun, President of Arturia. "Three years ago, looking at the solutions available for drums, we thought we could bring to this area a little bit of our expertise in virtual analog synthesis and physical modelling. Since we also wanted to include samples, we turned to reference companies such as Sonic Reality, Ultimate Sound Bank, Ueberschall and Modern Beats. The project has now come to an end and I believe Spark is a creative, simple and fun instrument to use. It offers recreations of many classic drum machines, an expected delivery from Arturia, as well as innovative drum sets and high quality sampled-based acoustic kits. We added many real time effects and a great controller to offer hands-on workflow. To me, Spark is a great alternative to all the MPC-style, Gigs-of-samples-based, complex solutions available today." o Vintage drum machines : Analog recreations in the spirit of the TR-808, TR-909, Simmons SDS-V, and Eprom based LinnDrum, Drumtraks, DMX, and more*. o Electronic kits covering the most popular modern music styles : Dub, House, Techno, Hip Hop, RnB… as well as experimental fields thanks to the physical modelling engine. o Acoustic drum kits subtly mixing physical modelling and samples for high audio realism.